Early voting in Walker County has definitely been "heavy" so far, according to an election commission spokesman on Thursday, Oct. 18. After only four days of early voting and limited to only one precinct, the downtown Walker County courthouse, more than 1,100 voters had cast ballots by the end of the day. Also very heavy was the new voter registration this year as more than 5,500 new voters registered for this midterm election. In all, 38,600 Walker County residents are registered to vote in the Nov. 6 election, compared with 32,951 registered voters for the 2016 general election. Both the state's hotly contested gubernatorial race between Democrat Stacey Abrams and Republican Brian Kemp and the local commissioner referendum seem to be the driving issues in this midterm election. While there are no local contested races on the ballot, Walker County voters are voting on the governor's race between Abrams, Kemp and Libertarian Ted Metz, as well as elections for the U.S. Congress, secretary of state, attorney general, state schools superintendent and the General Assembly. In addition, there are also seven proposed Georgia Constitutional Amendments and statewide referendum questions on the ballot. (For details of these items and for a sample ballot, go online to https://walkercountyga.gov/residents/elections. The most important local issue on the ballot in Walker County is the form of government for the future of the county. Voters in Walker will have the choice of keeping a sole commissioner form of government or switching to a board of commissioners. The referendum reads: "Shall the governing authority of Walker County be changed from a sole commissioner to a five-member board of commissioners with the chairperson elected at large and four commissioners elected by district?" Early voting for Walker County continues this week, but only at the county courthouse on Duke Street in LaFayette. Courthouse balloting will continue 8:30 a.m. to 4:30 p.m. Monday-Friday through Nov. 2. Voting is also available at the courthouse on one Saturday, Oct. 27, from 9 a.m. to 4 p.m.
Walker County voters also may cast their early ballots at a number of additional polling stations on Saturday, Oct. 27, and Monday, Oct. 29, through Nov. 2. Those Walker County precincts are: Chickamauga Civic Center, Georgia Northwestern Technical College, Lookout Mountain City Hall, and the Rossville Municipal Civic Center. Poll hours are 9 a.m. to 4 p.m. on Saturday, Oct. 27, and 8:30 a.m. to 4:30 p.m. Monday through Friday. The authority is under the leadership of Jeff Mullis, a state senator from Chickamauga who represents Walker, Dade, Catoosa and Chattooga counties and works to recruit and steer new industry and manufacturing to the area. By promoting the area's workforce, its tax credits, and its educational, environmental, recreational, and cultural assets, the addition of a major industrial player in any of the four counties will be felt economically across the entire region, Mullis said. The authority works closely with site selectors from across America and overseas. Site selectors for a given area such as Chicago or New York, for example, are brought to the area and spend a half-day in each of the four counties visiting and examining available sites such as industrial parks and gathering information on which to make their site selection choices. Mullis also reported on economic trips he has taken to China and other nations and reported that questions and discussions often focus on the tariffs issue. He reminded everyone, however, that such economic ventures were not funded by local taxes. NWGAJDA works closely with the Academy for Economic Development, the Appalachian Regional Commission, and other agencies to be sure that Northwest Georgia is getting its fair share of new economic ventures. One of the most promising areas for local government, especially rural governments, is the investment in broadband internet service, an investment that will reap economic benefits and profits for decades to come. As a quote on the home page of the authority from "View from the Top Investment Profile, Site Selection" magazine, says: "Georgia's upper left-hand corner offers superior accessibility, stunning vistas and a work force primed for the manufacturing renaissance." The Walker County Chamber of Commerce leadership team recently toured the John Howard farm in LaFayette and Bickett Genetics in Chickamauga to showcase and better understand the important role of agriculture in the county, which has 528 farms averaging 151 acres. There are nearly 80,000 acres of farmland and almost 25,000 acres of harvested cropland in Walker County. 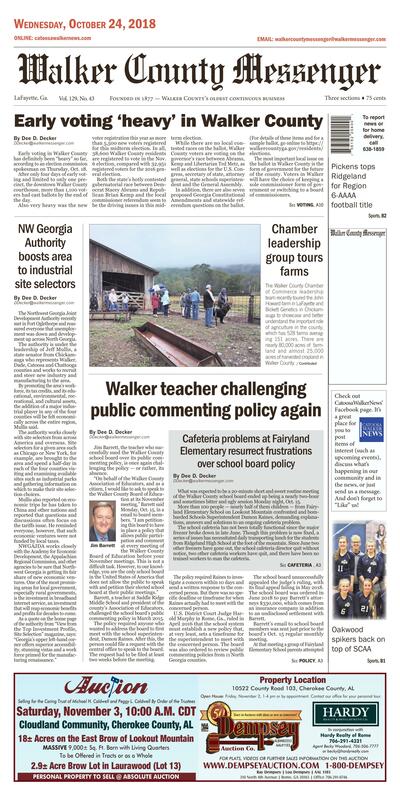 Jim Barrett, the teacher who successfully sued the Walker County school board over its public commenting policy, is once again challenging the policy — or rather, its absence. "On behalf of the Walker County Association of Educators, and as a citizen, I would like to ask to speak to the Walker County Board of Education at its November meeting," Barrett said Monday, Oct. 15, in a email to board members. "I am petitioning this board to have in place a policy that allows public participation and comment at every meeting of the Walker County Board of Education before your November meetings. This is not a difficult task. However, to our knowledge, you are the only school board in the United States of America that does not allow the public to speak with and petition their elected school board at their public meetings." Barrett, a teacher at Saddle Ridge Middle School and president of the county's Association of Educators, challenged the school board's public commenting policy in March 2015. The policy required anyone who wanted to address the board to first meet with the school superintendent, Damon Raines. After this, the person could file a request with the central office to speak to the board. The request had to be filed at least two weeks before the meeting. The policy required Raines to investigate a concern within 10 days and send a written response to the concerned person. But there was no specific deadline or timeframe for when Raines actually had to meet with the concerned person. U.S. District Court Judge Harold Murphy in Rome, Ga., ruled in April 2016 that the school system must establish a new policy that, at very least, sets a timeframe for the superintendent to meet with the concerned person. The board was also ordered to review public commenting policies from 11 North Georgia counties. The school board unsuccessfully appealed the judge's ruling, with its final appeal failing in May 2018. The school board was ordered in June 2018 to pay Barrett's attorneys $330,000, which comes from an insurance company in addition to an undisclosed settlement with Barrett. Barrett's email to school board members was sent just prior to the board's Oct. 15 regular monthly meeting. to address the school board concerning cafeteria issues this year at Fairyland. The board refused to hear the group because the board has no "public address" policy. Instead, Raines and School Food Nutrition Services Coordinator Michelle Coker answered parents' questions at the end of meeting, after school board members had left the room. Raines explained, "This (the cafeteria problem) is a day-to-day operational issue that has nothing to do with policy. So they (school board members) are not going to address something that doesn't deal with policy." He added, "We don't have a public participation policy. So while they're in session, in a quorum, they can't operate outside of that policy. That's why they left." Fairyland parent Brett Odom said following the Oct. 15 school board meeting, "The larger issue here — beyond the cafeteria issue at Fairyland — is that parents are not given any avenue to speak or address the board." The school board, in a response to the Oct. 15 meeting, released a prepared statement Tuesday night, Oct. 16: "... Members of the Walker County Board of Education have been considering a new public participation policy and are in the process of reviewing its previous public participation policy and public participation policies of neighboring and other school systems and are committed to developing a public participation policy for the Walker County school system." Barrett filed a "freedom of speech" lawsuit in March 2015 against the board's policy, won in U.S. District Court and the U.S. Court of Appeals for the 11th Circuit, and settled in July 2018. The court ruled the board's previous policy unconstitutional, struck down the policy, and ordered Superintendent Raines to rewrite its policy. Judge Murphy wrote in his ruling in the case on April 4, 2016, that the board's policies were "facially unconstitutional" in that the policy should guarantee people the chance to speak in a timely manner and that the school system should not try to prevent residents from criticizing school employees. Murphy said that everyone, and especially teachers, should be able to talk directly to their school board about issues of public concern to them and to their students. The judge also granted an injunction against Raines and the school district policy and told the board to revise its policy and procedure appropriately. What was expected to be a 20-minute short and sweet routine meeting of the Walker County school board ended up being a nearly two-hour and sometimes bitter and ugly session Monday night, Oct. 15. More than 100 people — nearly half of them children — from Fairyland Elementary School on Lookout Mountain confronted and bombarded Schools Superintendent Damon Raines, demanding explanations, answers and solutions to an ongoing cafeteria problem. The school cafeteria has not been totally functional since the major freezer broke down in late June. Though this problem is now fixed, a series of issues has necessitated daily transporting lunch for the students from Ridgeland High School at the foot of the mountain. Since June two other freezers have gone out, the school cafeteria director quit without notice, two other cafeteria workers have quit, and there have been no trained workers to man the cafeteria. Thus food is transported to the school daily and School Food Nutrition Services Coordinator Michelle Coker has been manning and supervising the cafeteria operations almost daily recently. Coker reassured the parents that "these children are our priorities" and that everything is being done and will be done to keep the cafeteria running until a full staff is trained and until all physical and staff issues are solved. Superintendent Raines also tried to reassure the parents, saying, "They're currently cooking things in their kitchen every day. It's just limited because their training is ongoing. So we are providing someone from Ridgeland (High School) to come up and work with them every day to make sure that they're specifically trained on everything that they need to do." Parent comments made it obvious, however, that the issue was about much more that the school's cafeteria. In fact, flyers claiming the school board is "stonewalling" them over cafeteria issues were distributed outside the school encouraging parents to attend a silent protest at a school board meeting Monday night. One of the major complaints and festering issues Monday night was the lack of communication between parents and school and school system officials. Repeatedly parents pleaded with Raines, "Please communicate with us!" and stressed that "The biggest problem is that we have not had communication." Raines said he met with some parents about the cafeteria issue approximately two weeks ago, where he gave them a timeline on what happened and a plan on what they'll do to resolve the issues. But parents told NewsChannel9 in Chattanooga that he actually met with only three parents in a closed meeting. The Fairyland PTO organized a parent-driven meeting last week to address the issue, and one school board member attended that meeting. "We could've communicated more, but we feel like we got that word out," said Raines, as he fielded questions from parents after school board members had left the meeting. "I'm not sure where it's kind of unraveled, but we are committed to getting the kitchen back, fully staffed, with the manager and a freezer that's working." In additional to poor or no communication with system officials overall is the parents' inability to talk and share issues directly with the school board. "The larger issue here beyond the cafeteria issue at Fairyland is that parents are not given any avenue to speak or address the board," parent Brett Odom said. As board members rose and exited the board room upon adjournment following their executive session, one parent screamed, "Wait! That's it? You guys are supposed to represent us." "Why won't the school board stay to hear all this?" another parent asked. After the board left, Raines explained, "This is a day-today operational issue that has nothing to do with policy. So they're not going to address something that doesn't deal with policy." Raines said a public participation policy that won't be challenged in court as unconstitutional is in the works but has not been finalized yet. Therefore, Raines and Coker fielded questions and comments from parents for more than 30 minutes. However, some parents were not placated, as one yelled, "You're not the board. You're a tyrant!" Another held a poster saying, "You cannot silence me; you will not shame me!" Overall, most parents were obviously sincere and respectful, though frustrated. "Why don't we have a policy where we can talk and respect one another and not get mad?" asked a parent. In closing, Raines reassured the parents that he would take what he had heard and relay it to the school board members. Parent Brett Odom summarized the discussion session: "This evening was a good start, but I am concerned that the board was not part of that conversation. By creating an environment where the board is not allowed or not encouraged to hear our input, I think there's a risk of the abuse of power."